1000BC is Bath City’s fan development working group dedicated to building average home attendances to 1,000. We’ve been in operation since Christmas 2015 driving initiatives like match posters, the weekly newsletter and online shop. 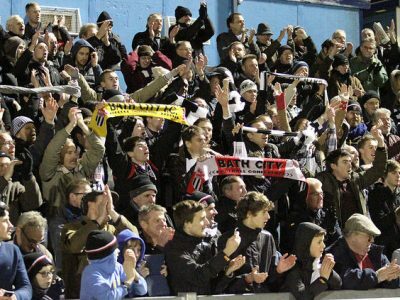 Since the success of the Big Bath City Bid and agreement to convert to community ownership, the team has become more closely involved as a marketing arm of the Club promoting a successful Community Day followed by the new Family Day and Women at the Game matches, as well as the launch of half-season tickets last Christmas. We reintroduced an Early Bird Discount as well as benefits including shop and drink vouchers. The results are that we sold 179 season tickets, up by 31% from 137 the previous season. Thanks to everyone who bought theirs. We exceeded our budgeted match attendances for friendlies by approximately 10% with Bristol City beating last year’s attendance despite terrible weather, while Bristol Rovers also delivered a strong crowd in competition with another Rovers fixture at Yeovil the previous evening. At this early stage, league attendances have been significantly up on last year. The return of Chippenham was always going to be a big occasion, but encouraging to see the crowd 80% higher than the Weston-super- Mare fixture on the same Tuesday last year. Likewise Chelmsford drew a crowd 30% higher than St Albans on the equivalent Saturday last season. We’ve budgeted average attendances of 700 this season, up from 617 in 2016/17 – an increase of 13%. We’re using a range of promotional tools to get the word out, including a package of adverts in The Chronicle, city-centre flyering for the Chippenham match, posters, and tactical Facebook advertising which appears to generating significant interest and engagement. We plan to do more flyering for key matches – so do let us know if you can help. Please contact us at info@bathcityfootballclub.co.uk if you’d like your school to be involved. We’re focusing on Newbridge schools for the first match this autumn. We have Student Reps at both Bath Spa and the University of Bath helping to engage with students. We’ve booked space at Freshers’ Fairs for both universities (27th and 29th Sept) as well as Bath College (13th Sept Bath, 20th Sept Radstock). We’ll encourage attendance at the Community Match and also Student Day. The huge student population, displaced from their home clubs, represents a massive opportunity to develop new fans who can be engaged with the Club for two-three years and beyond. Please contact us at info@barthcityfootballclub.co.uk if you’re interested to help with any of the Fresher’s Fairs. We’re beginning to place framed shirts in local pubs that wish to show their link to the Club. So far Flan O’Briens and the Belvoir Castle are proudly displaying them, with the Royal Oak on Lower Bristol Road soon to join the ranks. The Club and relevant pub share the cost of the shirt and frame, paying £35 each, with a limited number budgeted each season. Contact us at info@bathcityfootballclub.co.uk if you’d like to suggest a pub that will support this campaign. Our group contributes to the wider discussion about how to make the Bath City matchday experience more enjoyable. Our feedback has helped to encourage the Club to use more contactless card machines, the introduction of guest caterers, the enhanced End of Season Awards and faster service in Charlie’s. 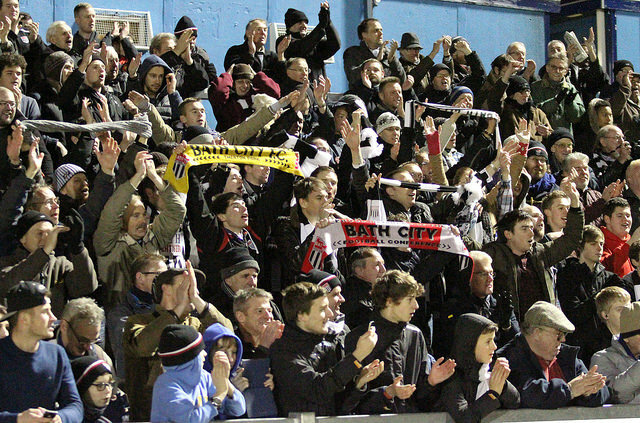 Building larger crowds is fundamental to the health of Bath City FC. As well as the money paid on the gate, each visitor to a match is likely to bring additional revenue through the bars and Club Shop, while larger crowds also create a halo effect that makes sponsorship and other commercial investment more attractive. Just as importantly though, bigger crowds are more fun, creating a buzz and atmosphere that enhances all our enjoyment of the match. Thanks to everyone who’s part of 1000BC and everyone around the Club that supports its efforts. Do get in touch if you’d like to contribute in any way or be part of the group.